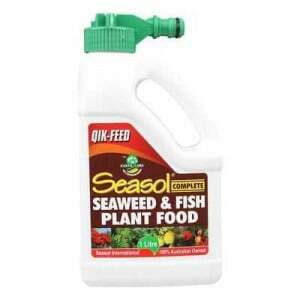 I use this for every plant that I transplant to ground or into bigger pots. It reduces the stress on the plant and helps them get going again. A lot of plants will stop growing for a time when moved but this helps them adjust and be happy again. Some people hate the smell of seasol however I find it reminds me of the ocean. Seasol helps a plant to develpe a string root system, which produces a healthy plant with better resistance to pests, heat etc. It helps flowers bloom and fruit grow and it is not harmful to bees like some garden products. This works great on not just lawn but did wonders bring back my miniture apple and lemon trees easy to use pop on hose connection. How would you rate Seasol Quick Feed Compost Garden Hose On?